What’s a hard-core music freak to do when you’re out on the town and you need to check tour dates for your favorite bands? No sweat—just pull out your iPhone or iPod touch and fire up Groupie from Philipp Seibel Softwaretechnik. The $1 app tracks upcoming concerts. The Show Must Go On: Groupie relies on data from Last.fm to tell you when and where your favorite musical acts will be appearing. Groupie is very easy to use. Just go to the Search pane, enter an artist’s name and tap on Search to produce a list of matching names. Tap on a name and you’ll get a list of upcoming tour dates. You can view more detailed concert info if you want, and you can save artists and show dates so you can return to them more quickly. Groupie will also suggest similar artists as well as send concert info via the Mail app or plot venue locations using the Maps program. If you just want to see what’s happening nearby, go to the Local Concerts pane and either search by city or let the app grab your current location. 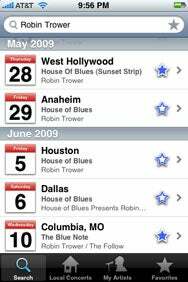 Depending on the location and search radius you’ve selected, your results could possibly return a huge number of events, so it would be nice if Groupie let you filter these results by genre, artist or date. I did encounter a few other small annoyances. After you’ve searched for an artist, the keyboard doesn’t disappear, so it obscures part of the search results. Once you’ve navigated within the app, there’s no easy way to back up to your search results. And, since the app is powered by the online mega-music site, Last.fm, it would be nice if you could enter your Last.fm account info so that Groupie could grab favorite artists and other data from your online profile. However, the biggest issue I had with Groupie is that its concert listings are not always complete. For example, a search for “Fleetwood Mac” brought up the band’s complete itinerary, but a search for “Robin Trower” displayed only about half of his show dates. Since Groupie relies on a single data source (Last.fm in this case), I can understand why some artists’ data might be more complete than others. That’s why I think it would be nice if the app could hook into additional services, such as Pollstar, in order to make sure that tour listings are as complete as possible across a wider range of artists, genre and popularity. Otherwise, Groupie’s interface is simple, clean, and effective, which really appeals to my minimalist senses. That makes it easy to find what you’re looking for—just as long as you remember that the info you’re seeing might not be complete. So, if you have your heart set on seeing Robin Trower this summer, just make sure to check the TrowerPower Web site first before making your travel plans. Groupie is compatible with any iPhone or iPod touch running the iPhone 2.x software update.